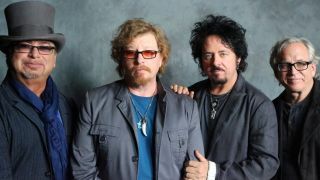 Veteran US rockers Toto have released a promo for their track Orphan. It’s lifted from their upcoming album XIV which launches on March 23 via Frontiers. View it below. And although it will be their first studio outing since 2006’s Falling In Between, keyboardist Steve Porcaro said the band are looking on the new material as the follow up to 1982’s Toto IV. The album is currently available to pre-order form iTunes and Amazon. The deluxe edition comes bundled with a bonus DVD containing a making-of documentary and a booklet featuring interviews and exclusive pictures. They’ll head out on a European tour kicking off in Glasgow on May 21, while a US tour with Yes in August has been hinted at.